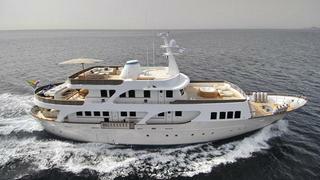 Paul Joubert at Yacht & Property International asks me to spread the word about a €1.3 million price drop on his central listing, the 33.8m motor yacht Evergreen V.
A Benetti Sail Division 112 superyacht built in 2008, she’s styled as a classic gentleman’s yacht, combining 1930’s looks with a modern and comfortable interior design. Outstanding exterior and interior volumes give her the atmosphere of a much larger 42m superyacht. Her capacious interior accommodates between eight to 12 guests in two master suites, a VIP stateroom and two twin cabins plus two Pullman berths. Evergreen V is fitted with all the expected extras in electronic and communication systems and features zero speed stabilisers. Evergreen V is now down from €5.4 million to €4.1 million.